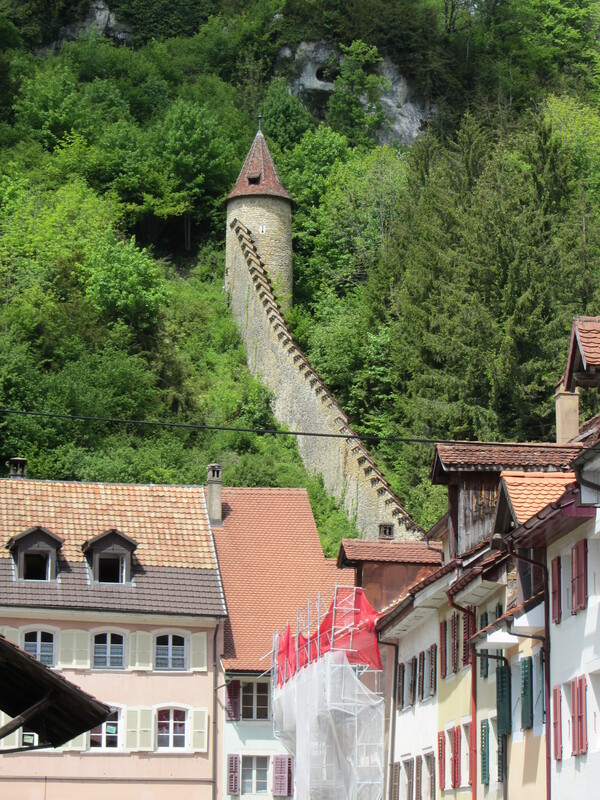 Saint Ursanne’s town core appears to have been a fortress that steps up into the Jura cliffs. Saint-Ursanne is reportedly home to the sarcophagus of St. Ursicinus, a 7th-Century Irish monk exiled from France’s Burgundy region, although it is not clear if Ursicinus himself was exiled, or if he was merely following St. Columbanus who was most probably exiled, but may have just left the area due to continuing annoyances with the Frankish bishops. Apparently, when the French called St. Columbanus to court to defend his observation of the Celtic dates for Easter, he simply failed to appear, but gave them the courtesy of a letter in which he reportedly said the bishops might include other important topics among their priorities besides the ancient Celtic religious calendar, all of which goes to show that Europeans have been rubbing each other the wrong way long before the Eurozone was introduced. 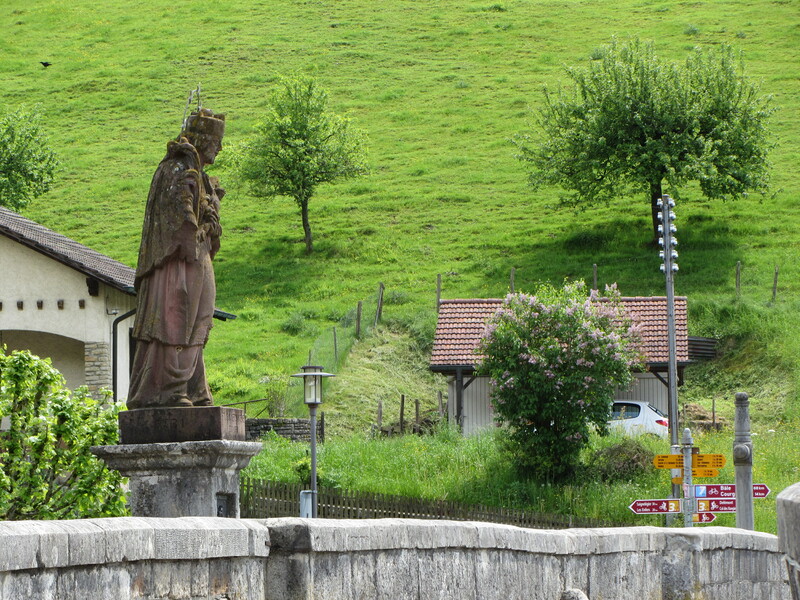 A replica of a statue of St John Nepomuk stands at the midway point of Saint-Ursanne’s Pont Saint-Jean Nepomucene. Built in 1973 by Laurent Boillat, it takes the weather-beatings, while the original statue carved from red sandstone hewn from Basel’s region is safe inside a nearby museum. St. Columbanus is, by the way, the patron saint for motorcyclists, although how that happened I do not know because it would be 1,100 years after Columbanus’s death that motorcycles would be invented. No matter. Intriguingly enough, Saint-Ursanne was packed with motorcycles the day we were there. I did not photograph any because motorcycles seem visually incongruous with 12th Century architecture. Not everyone will agree with me about this. Despite this town’s close proximity to the French and German borders, there was no mention in the brochure of how it weathered either World War, particularly WWII when the Swiss were readying to head for the hills in response to a threatened German invasion. There is an engraved marker in the cliff by the train station that lists WWI dates, so we might assume that Saint-Ursanne was among the Swiss observation points during that conflict. Saint-Ursanne will be honoured this year (2012) by the Tour de France, which will pass through it around July 7th. Tripadvisor only lists two inns in Saint-Ursanne. A Google search shows a little more than that. 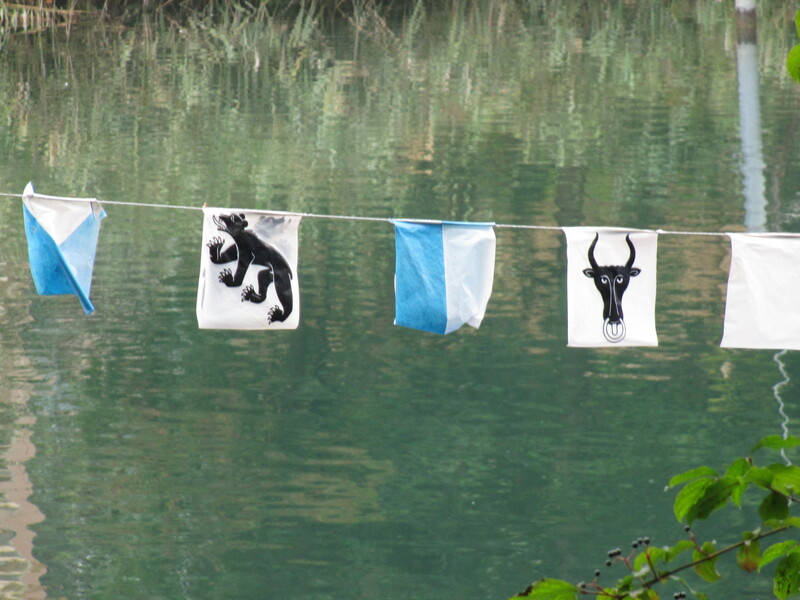 A nearby company rents kayaks and canoes for a paddle in the River Doubs. Switzerland: Land where Nyquil & Melatonin users viewed with suspicion. Heroin-addicts and alcoholics are okay. This is what happens to me when I spend a protracted amount of time in a linguistic stew. I stumble over four languages in a nanosecond, which is what happened when I greeted the pharmacist at the local apotheke (pharmacy) yesterday. “Why did you start in a language you can’t even speak,” my beloved asked. Why indeed. The pharmacist had Iberian skin tones and black hair, a visual cue that sprung the floodgates on the little reservoir of Spanish my brain has boxed up since our days in Madrid. The pharmacist’s responding look of incomprehension then caused the linguistic data to disperse at the synaptic cleft between my neurons, form into a ball and ping pong around my brain, hitting as many languages as possible. Given enough time, I might have recalled the Japanese that Mrs. Kirbyson tried to teach me in 1975. I wonder if time-zone-trader Angelina Jolie has trouble sleeping. It turns out the gentleman spoke English, but by then I had forgotten how to manage even that and so I persisted in my usual muddled melange. Dave just stood back and watched the show. I am always in a slightly peeved mood when I go to a pharmacy in Europe, which is something like visiting a North American drug store in 1952 when everything was kept behind the counter and a conversation with the druggist was mandatory. I’m actually not sure about that being the case in 1952, but Hollywood tells me this is so and I’m too linguistically hungover to investigate further. In Switzerland, something as mundane as NyQuil (called Medinait here, for those who need to know) can only be purchased after assuring a pharmacist that the buyer does not have asthma, glaucoma, a family history of glaucoma, neurofibromatosis, halitosis, a tendency to crack knuckles, arthritis, phlebitis, elephantitis or a cough that has lingered for over a week. Who would think a cold medication would come under such strict controls? Costco's Melatonin: There's the good stuff. But there’s more. Even the non-drug Metamucil (a non-medicinal soluble fibre product that does wonders for cholesterol counts, by the way) requires conversational counter-time with the drug-store staff. Last week, I learned that melatonin* – a rather innocuous hormone that flits about in the pineal gland governing our sleep cycles – is only available in Switzerland by prescription. Melatonin has been an on-the-shelf product in the U.S. since the 1990s and in Canada it can be bought in comforting large containers at Costco stores, yet when I asked for it, the Swiss druggist gave me the studious stare associated with searching for signs of drug addiction – that is, my drug addiction. But then, considering how I opened our conversation in a multiplicity of languages that I don’t actually speak, who can blame him? I find this fascinating in a country where heroin and other narcotics are legal, and if I wanted such I could probably just drop in at the local injection clinic and load up my veins. Alternatively, if I’m having trouble sleeping and can’t access my usual supply of melatonin, a cheap and ready source of alcohol of all sorts can be purchased at any food store. I looked down my nose at the men lining up at a nearby convenience store with their beer and booze during the supper hour, but now I realize they may just be fellow-insomniacs whose melatonin-prescriptions have run out. Most hits come from the U.S. Readers from Japan did not even register in my country list. I cannot break into that readership. Dang. * DO NOT USE THIS WEBSITE FOR MEDICAL INFORMATION: To learn more about melatonin, go to legitimate medical websites, such as mayoclinic.com. Tagged a family history of glaucoma, a tendency to crack knuckles, Allemagne, Angelina Jolie, apotheke, arthritis, asthma, Canada, circadian rhythm, cultural differences in drugstores, drugstore, elephantitis, France, French, German, Germany, glaucoma, halitosis, heroin, injection clinic, injection site, insomnia, Madrid, Mayo Clinic, medication, Medinait, melatonin, Metamucil, methadone, neurofibromatosis, NyQuil, pharmacist, pharmacy, phlebitis, sleeplessness, Spain, Spanish, U.S.
Cathedral Saint-Pierre, Geneva, Switzerland. 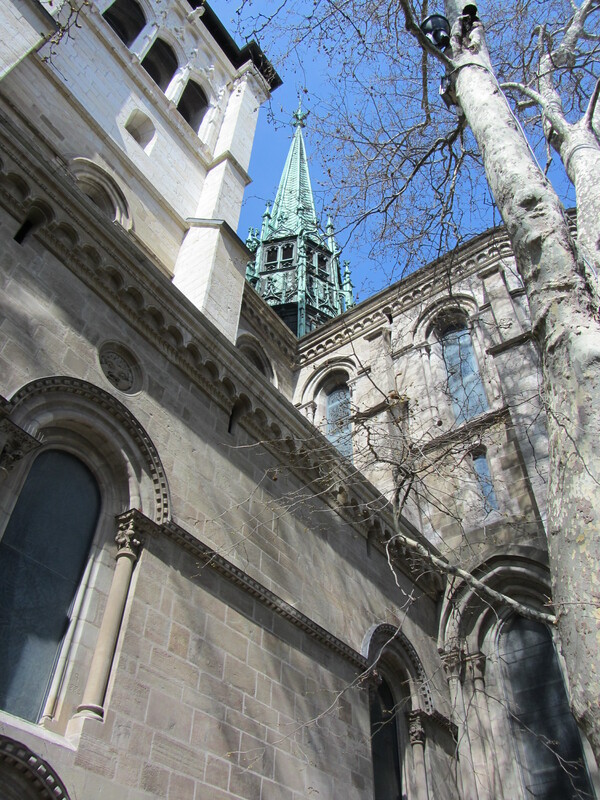 A Romanesque-Gothic structure dating back to 1150 A.D., which took 150 years to build. A church has stood here since the 4th Century and before it, a Roman temple. There is an archaeological dig and crypts beneath it. 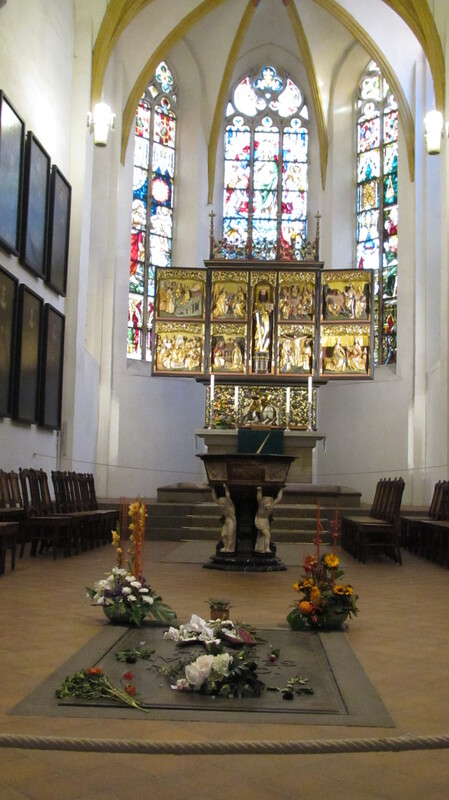 The church went from Catholic to Protestant in 1536, when it was stripped of its icons and other adornments that Protestants view as a form of idol worship, but that Catholics look upon as markers of the faith and examples from the lives of early saints. See notation below. 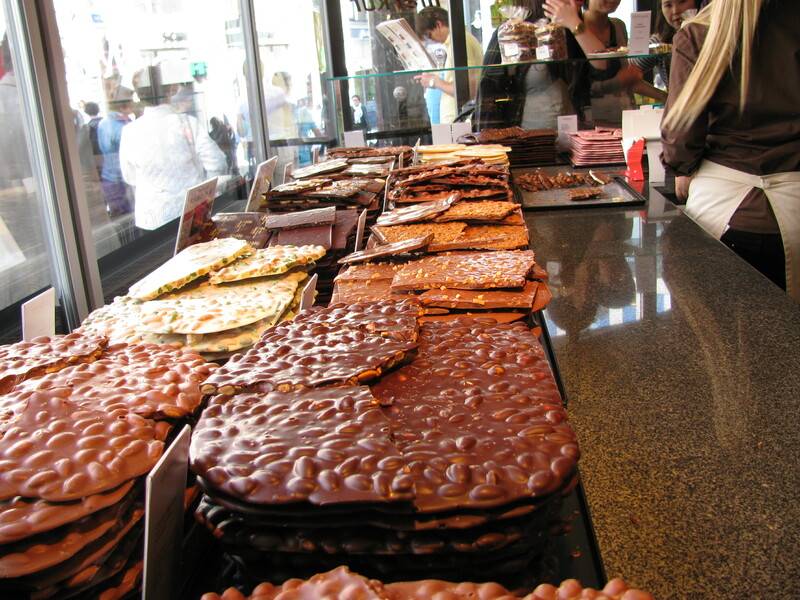 Daniella, one of our favorite Swiss friends, crinkled up her nose at learning we spent a day in Geneva. “Why ever would you go there?” she asked, staring at me for signs of mental instability. “Yes, but whyyyyyy would you go there?” she repeated. But many do go to Geneva, possibly on mandatory business travel, and those people still want to know what to do once they’ve checked into their hotel room. One suggestion would be to get on a train to visit Gruyeres or Montreux, in other words, to get out of town as fast as possible, but it is not necessary. This is a literal statement. John Calvin (1509 to 1564), arguably the most influential thinker and theologian in the Reformation, and also a humanist lawyer – yes, a lawyer – preferred to give his sermons sitting down, which leads to suspicions that his sermons might have been a tad too long. On investigation, however, we discovered the chair in which he sat was/is a straight-backed wooden thing with no cushioning whatsoever. I could probably deliver a seven-minute sermon in it, tops. Ooooo, dredging equipment. This photo shows that this blog values engineers and those inclined toward technology. 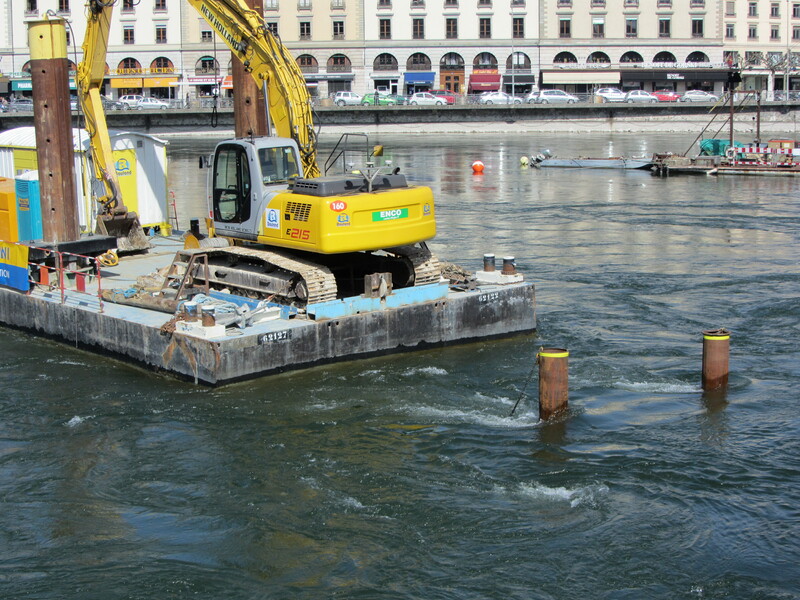 Tourists with an engineering bent can enjoy the dredging equipment currently parked in at the mouth of the Rhone – which is surprisingly shallow for a waterway feeding off massive Lake Geneva. The city has many parks which will be beautiful once the trees are in leaf (in Geneva’s defense, we did get there at the turn of Spring when greening-up was just starting). One-quarter of Geneva is parkland – that’s something to think about. 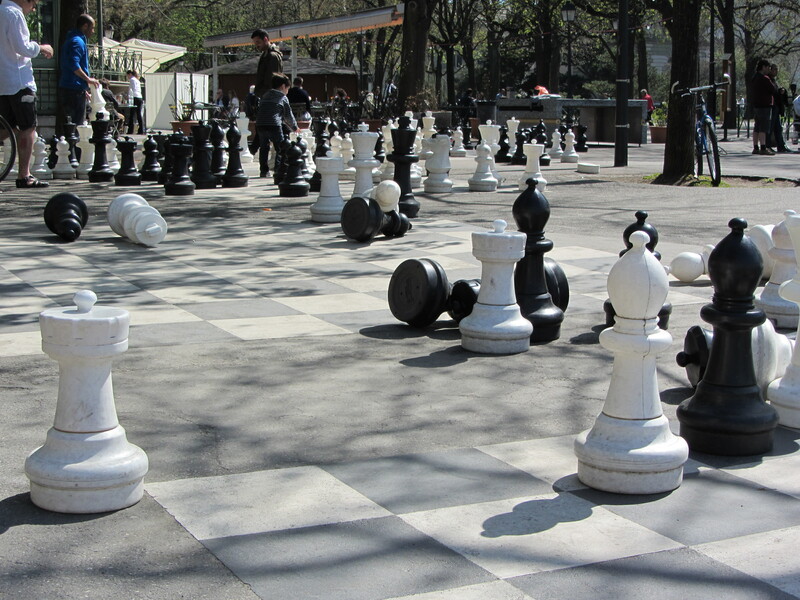 Bastions Park has a charming open-air cafe for lounging away a sunny day, large chess boards enjoyed by many, and shady promenades, as well as the historic statues marking the city’s fulcrum point in world history – that is, statues of the fathers of the Reformation. I say “fathers,” but I’m sure there were “mothers,” too, but they didn’t make it into the statuary. 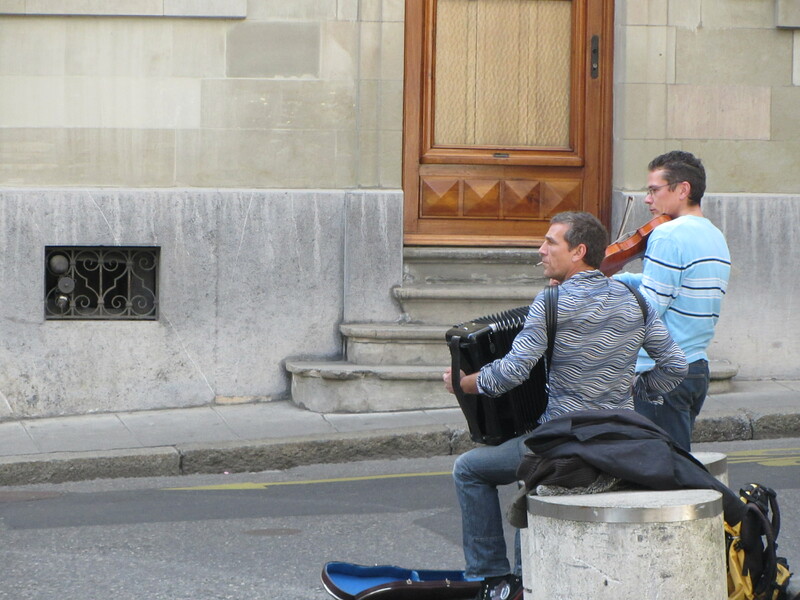 This accordion/violin/vocals duo from France gave Geneva's old-town a wonderful musical air. They were truly amazing. They would not give us their names, however, they said they were called "Children of the World." They also accused their countrymen, the French, as being unappreciative of the musical arts and so they came to Switzerland to perform where the people are more cultured. Take that, France, from your own cultural citizenry. It may seem to not matter so much to some, but these were the seeds of the freedom of expression and worship that the Western World now prizes. It was when a bunch of Christians sought to weed from the then Catholic Church it’s powerful political core and return it to what nowadays would be called its grassroots origins, that is, the Gospel of Jesus Christ who had never held any worldly position of power or even aspired to such. So, historically, a visit to Geneva is a little like a visit to Leipzig, Germany which triggered the fall of Communism and the Berlin Wall. The cobblestone lanes are charming now, but it doesn’t take much imagination to envision the intensity of emotion and peril that the city streets once hosted. Notation on blog accuracy: The dates given on historical events, such as when churches were built, protests staged, and so forth, are taken from the best source I can find. Often, however, we see different dates expressed in travel books, academic websites and reliable legitimate media sources, as well information given in the site’s brochures and signage. This is a conundrum. I list the dates that are agreed upon by the most reliable sources, leaning heavily toward the local sources who would have most familiarity with the subject. If it’s a draw as to which date is more reliable, I list the range of dates given. Also of note: Ancient structures usually have multiple “additions,” and so this blog lists the earliest date for a still-in-existence portion of the structure. This probably explains part of the confusion over dating. *Another note: To be fair on the question of the first English translation of the Bible, Catholic apologists point out that when the Bible was printed in Latin, it was not as exclusive as it seems, because Latin was the language of the educated classes. I am not a theologian or a church historian, so this is as far as I will go on this topic. Please post angry letters through this blog’s contact page. Most hits come from: Australia. “Change Room Etiquette” post again shows up in top three hits. 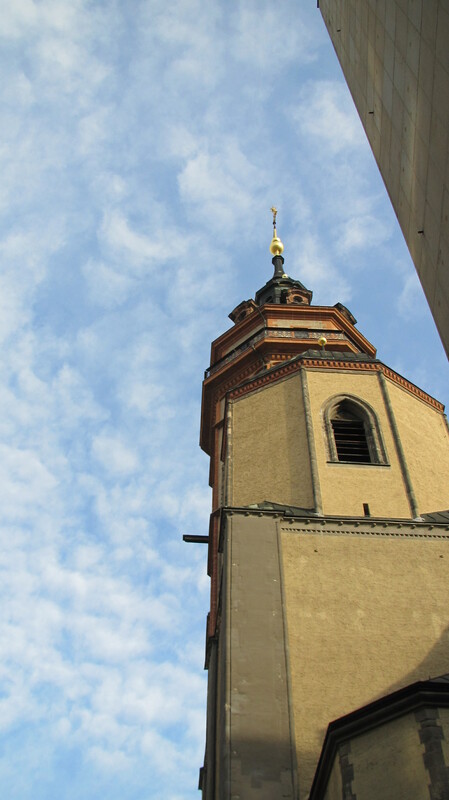 Leipzig Nikolaikirche, the birthplace of the teardown of the Berlin Wall. Some bad things have happened to my family in Germany, like European airlines extorting money from us in $500 chunks to let our dog or a bike pass through Frankfurt airport, and then my Dad was arrested there for refusing to be an informer for the Soviets. Tough luck, that. 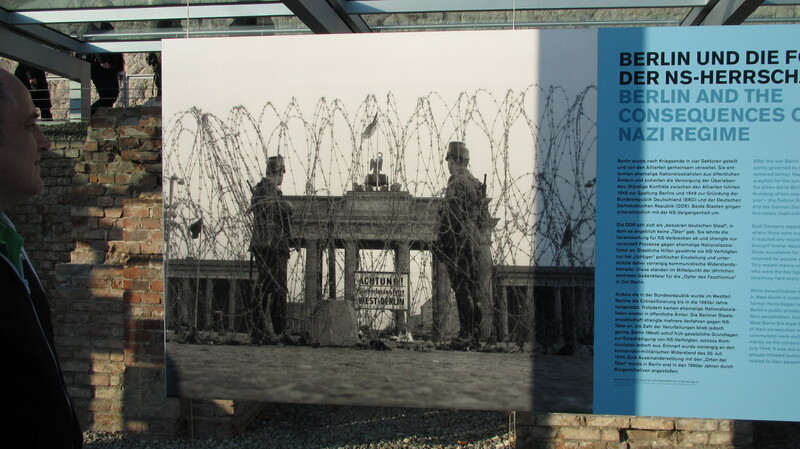 The Berlin "Wall" as it appeared around the time my father tried to cross into West Berlin. But none of those things occurred on this trip to Leipzig, so hopefully our bad run with Germany is over, which is a good thing because, gosh, their food is much better than expected, and certainly better than what they fed my Dad in that jail. Leipzig has some sadly decomposed old grand buildings, such as the Astoria, which are almost as interesting to look at as the medieval quarter of town. The city’s northern outskirts are somewhat depressing, stretching out in decayed old industrial zones perhaps still lagging behind due to Communist rule even 30 years after the Germans gave the Soviets the boot. Nevertheless, the city centre outside of the historic quarter is lined with beautiful old architecture. 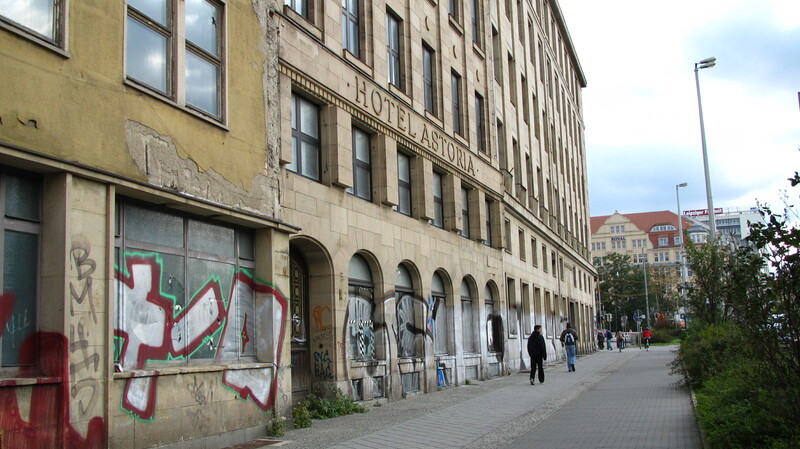 Leipzig's Astoria hotel, a grand old dam now in serious disrepair. Less well-known to North Americans (but very well-known to Germans, I imagine) is that Leipzig was a beachhead of sorts during the Second World War. The Brits and Americans were busying themselves with bombing Berlin, when one night the Germans launched a significant concentrated counterattack, punching a big hole in the Allied Forces air fleet. The next night, the Nazis readied their forces for a repeat performance only to have the Allied fighter planes skirt around Berlin and hit Leipzig hard. It was a shock to the Germans, as the Allied Forces had never gone that far into Germany, and in fact, it was thought at the time that such a distance was out-of-range and safe from airstrikes. Leipzig also housed a concentration camp. As the Allied Forces moved in, 12 Nazi guards torched a bunker with 500 prisoners in it, many of them Russians and Czechs. As some prisoners escaped the flames, they were gunned down by the 12, and those that escaped the bullets died in the electric fencing. Very few lived to relate the story. It’s the sad and shocking history of Germany, and another testament to the fact that there is no army so savage as a defeated one. Hard to believe the culture that nurtured those 12 guards is the same one that was home to Bach, Mendelssohn, Goethe, as well as being the birthplace for Schuman. Leipzig still has a vibrant arts community, a university and parks, although I only walked into one park and immediately turned around as it seemed to have a derelict population. Probably nothing wrong, but why take a chance? 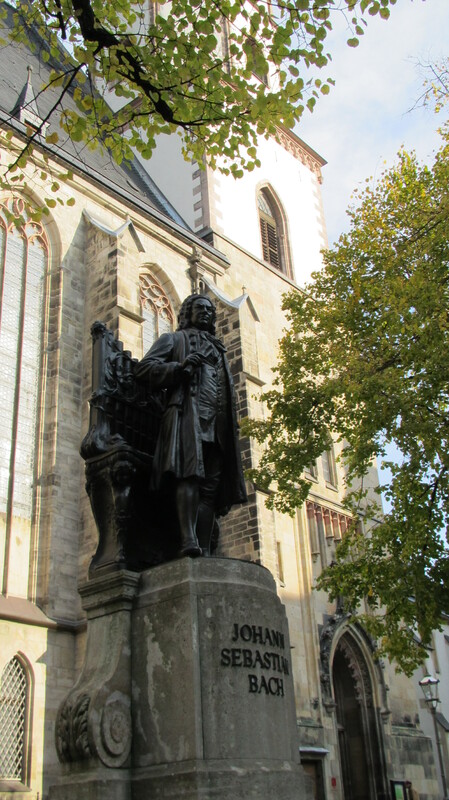 Bach statue outside of Thomaskirche where he is buried. 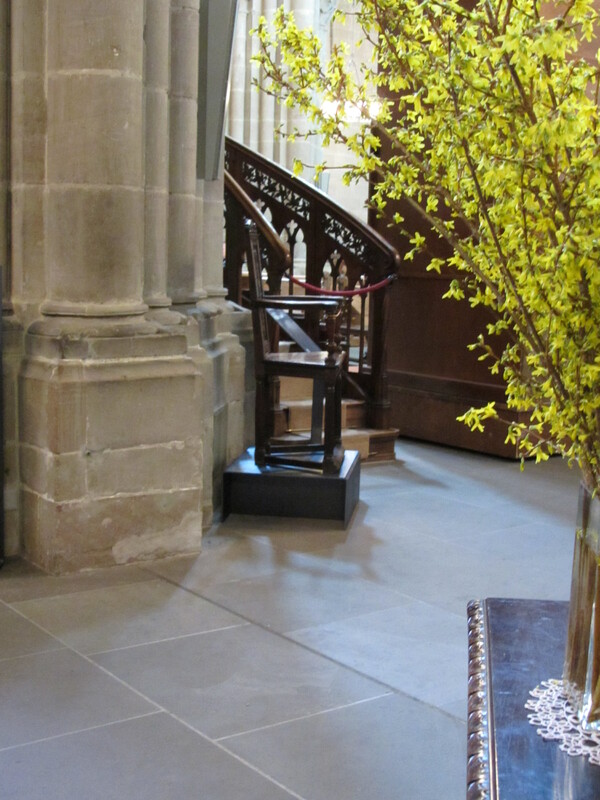 Bach's burial site in the austere Thomaskirche. We hung around outside the building one night, listening to an organ playing. Most of the lights were out, and the church was dark. It was beautiful and haunting. 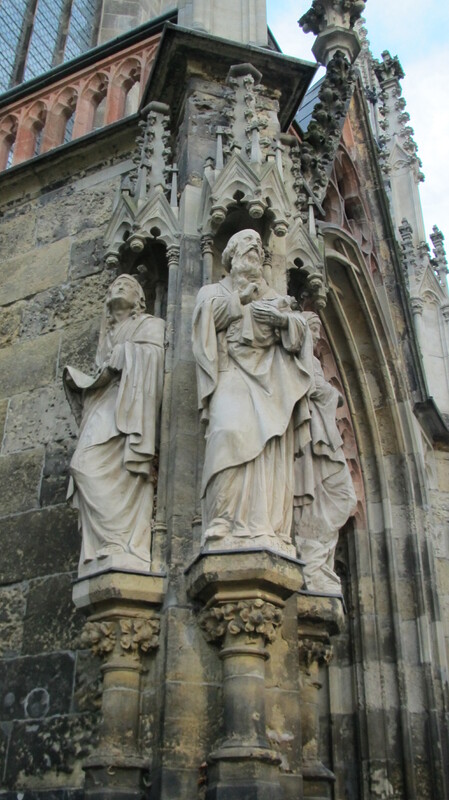 If I had learned German instead of French, I would know what this inset statuary is all about at Thomaskirche. As it is, I don't know a thing. 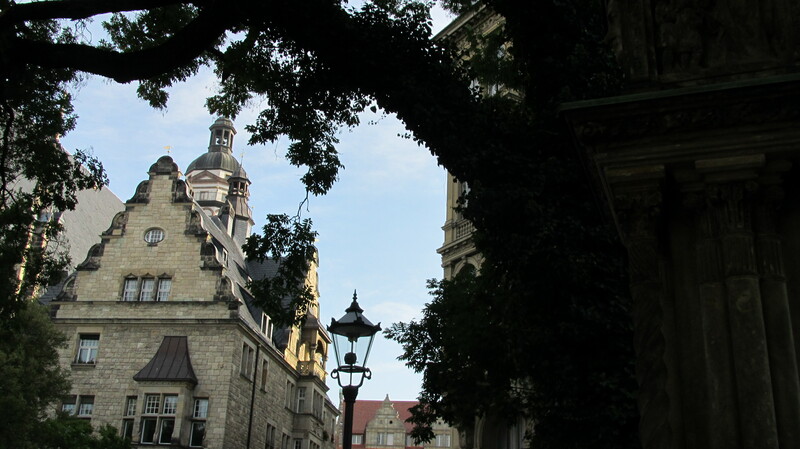 Leipzig, a past that is dark and light. An amazing place, and worth the trip.